The Design Exchange in Toronto announced the winners and finalists for its annual award program. While 1Q84, the new novel by Haruki Murakami, continues to garner mixed reviews, Azure chatted with Chip Kidd, its cover designer, about inspiration, process, and typesetting. On November 2 and 3, the Registered Graphic Designers of Ontario hosts Designthinkers, the annual conference that taps into the minds of those blazing the trail in graphic design. Here are our top five must-sees. With its beautiful architecture and vibrant graphics, the new building for the Queens Public Library branch in Jamaica, New York, provides the ultimate learning experience. One local research and design collective uses ideas, insights and data to push urban planning into the future. Azure chats with two of the three partners, Brendan Cormier and Christopher Pandolfi, to find out how they plan to save our city. 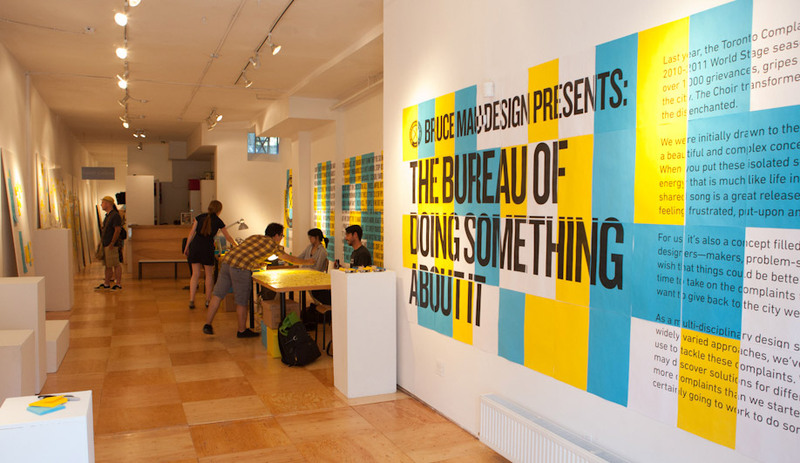 This weekend is the last chance to check out Bruce Mau Design’s The Bureau of Doing Something About It, an interactive exhibit that sees the BMD team create solutions on site for more than 1,000 complaints submitted by Torontonians. Last night, Toronto’s OCAD University unveiled its new visual identity, designed by internationally renowned studio Bruce Mau Design. The Smithsonian’s Cooper-Hewitt, National Design Museum presents the first major US museum exhibit of the Jewish-French artist’s works in over 30 years.